Outstanding Sea and Hill Views, close to several beaches & restaurants. A well furnished. secure and spacious 1 bedroom apartment on the top floor of a modern development. The development has its own swimming pool on the lower level where parasols and sun beds are provided. 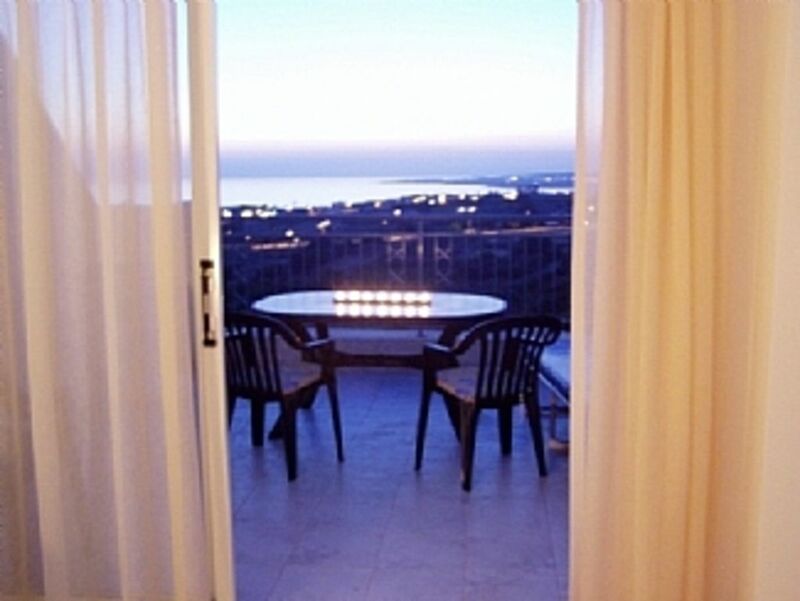 The apartment has a wide terrace facing directly West - great for sundowners - with an uninterrupted panoramic views of the sea and hillsides to the north. Night time views are especially romantic. Both the living area and bedroom have sliding glass patio doors that open directly onto the terrace giving you a lovely view to wake up to. The apartment is situated on a hillside just below Kissonerga village, only 1km from Vardas Beach, and 5 mins drive to the famous Coral Bay beach. Wi-Fi connection is included. Fully tiled modern bathroom with granite topped vanity unit, wash handbasin, WC, full bath, power shower, extractor fan and electric shaver point. A.C.Units in Living Area & Bedroom. dedicated parking slot for the apartment. Spacious living/dining room with sliding glass doors to terrace. Large sofa and 1 comfy armchair, coffee and side table. Glass and iron dining table with 4 chairs. New 32'' LCD flat screen TV,Wi-Fi & Internet TV, DVD/CD player and a selection DVDs/CDs. Open plan, granite work surfaces, ceramic hob, electric oven, microwave, fridge/freezer, front loading washing machine, kettle, toaster, clock, ample crockery, glassware, cutlery and cooking utensils. Steam iron, ironing board and clothes airer. Large west facing terrace. Sunsets every evening. Our property is more than 2 & 1/2 hours away, but if you're keen skiers like us, you'll probably want to take at least a look, if not a couple of runs on the Troodos Mountains! The snow is only ski-able in mid-Winter and should only be considered as a possible, pleasant, add-on to a sunshine holiday. There are several golf courses in the area and within less than a 5 min drive you will find a new driving range and Target Green. There is a lift to all floors and a reasonably wide 'walk way' on each landing. The entrance door to the apartment has a largish opening. A dedicated parking place and no stairs between that and the lift. From the lift to the pool there are a few stairs, but the area around the pool is flat. Regarding access to the area immediately outside the development, for those with poor mobility a car would be a good idea. Should you require measurements of doorways etc please get in touch. Notes on accommodation: Both the bedroom and living/dining room have air-conditioning. Lift to all floors. Own parking space. Adults only. Non-smokers. Outside: Shared patio area with swimming pool, sun-beds and parasols. Small gardens. Dedicated parking areas. Cleaning / Towels / Linen / Maid service: All bed linen and apartment towels supplied. Apartment cleaned prior to arrival and on departure. Other: Terrace has large dining table with parasol and 4 chairs and outside lighting. There is a bookcase in the living room , with books,games and tourist brochures & maps, also cards with comments for local tavernas & restaurants. 1km to the beach, Vardas Beach, and 5 minutes drive to the famous Coral Bay. Polis and Latchi to the north, where there are some nice beaches, are approx. 35 to 40 mins. away by car.In the other direction towards Pomos, you'll find Agia Marina. Here there is a good beach with a beach bar called Saint Barbara. They supply sun beds & umbrellas & good lunches. Past Coral Bay, towards Ag. Georgios, you'll find Sunset Taverna (good food), turn rt. & follow the "rough" road to LARA.Good beach & lunch. Paphos Airport 30 mins drive. We would recommend you hire your car from Paphos Airport prior to leaving the UK. Locally there are at least 2 bus services within 1km walk from the apartment taking you to either Paphos harbour or Paphos town centre. Both buses go to Coral Bay in the other direction. There are plenty of taxi services in and around the Paphos area. Kissonerga village, with an English speaking bar ,Julie's, with good English & Cypriot breakfasts and free Wi-Fi access. Tweedie's is a good quality restaurant close by, both less that 1km away. Within easy walking distance, are Vardas Beach & Taverna and Harmony Restaurant.Closest of all is Manzanillo, a new restaurant. In fact , you can see all 3 from the terrace. There is a supermarket towards Coral Bay called Phillipos, but we tend to use Papantoniou which is through Kissonerga Village on the road back to Paphos,less than 10 minutes drive from the apartment. They have a great fresh fish counter, deli. and fresh meat counter and ,of course, fresh local fruit & vegetables. You can buy everything you need here. Keep an eye out for cheap wine deals and stock up if you find something you really like. Lidl have also opened up on the beach road and their wine is good quality & very cheap.